Palestinians living in the district of Hebron, in the West Bank, suffer the consequences of confrontations with Israeli forces and the settler community, intra-Palestinian disputes among different political factions, the difficult economic situation, domestic problems and general frustration. All of this takes a heavy toll on the population, suffering from depression, trauma and other anxiety disorders. 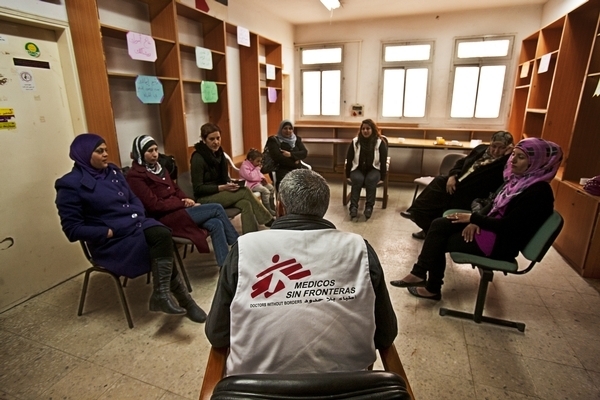 Médecins Sans Frontières (MSF) is running a programme in the district of Hebron aimed to alleviate the suffering of victims of violence caused by the conflict, offering psychological and social support as well as medical care. In the web documentary, “Confronting Trauma: MSF’s mental health project in Hebron”, MSF gives an overview of the situation in the district and the old city of Hebron and explains how MSF staff responds to the needs of the population. Through the stories of Palestinian families and interviews with people working for MSF, this documentary shows how relentless violence has an impact on people’s health and in their lives. Jump to interview with Head of Mission. MSF has been working in the Occupied Palestinian Territories since 1989. In 2011, MSF teams provided psychological, medical and social support to people in Gaza, Hebron, Nablus, Qalqilya, Tubas and East Jerusalem. In total, MSF staff carried out more than 1,600 medical consultations, and more than 4,000 mental health consultations. Manuel López Iglesias, Head of Mission for MSF in the Occupied Palestinian Territories, talks about the situation in the region and explains MSF´s work. Why is Médecins Sans Frontières working in the West Bank and what are the needs of the people our teams assist? Médecins Sans Frontières has been working in the West Bank since the first Intifada as a consequence of all the violence associated with the conflict. At the beginning of the second Intifada our teams observed that there were not only patients who were experiencing problems of access to the health structures, but also a lot of people with trauma associated with the violence they had lived through, who needed mental health care and psychosocial attention. That was the reason why we started in the year 2000 a mental health care project in the governorate of Hebron, to provide the much needed psychosocial care to the victims of violence. MSF teams focus on people with psychological distress (depression and anxiety disorders such as acute stress and post traumatic syndromes) caused by violent incidents involving Israeli settlers and Israeli Army, but also due to the intra-Palestinian conflict. Also recently, in 2011, we have started a very similar program in East Jerusalem, in the part of the city occupied by Israel in 1967, and especially in Shufat Refugee Camp and in Silwan, where violence, exclusion and political tension are more prevalent and problems of access to the health care services in general and services of mental health care in particular are more acute. What is the level of mental health care services provided to the Palestinian population in the West Bank? Generally in Israel the level of mental health care services is quite high. But access to these services for the Palestinian population is very limited. In Israel controlled areas there is a clear discrimination in the quantity and the quality of the services provided to the Israeli part of the population and the Palestinian one in respect to mental health care. In the area of the West Bank controlled by the Palestinian Authority and in Gaza, controlled by Hamas, health care services are insufficient, especially mental health care services. The proportion of government expenditure on mental health care tends to be low in relation to general health care expenditure with less than 2% of the national health budget devoted to mental health services and approximately 90% of this spent on tertiary level care (psychiatric hospitalization) largely confined to urban areas. For these reasons MSF has chosen to provide mental health care as well as medical and social support to the people living in the Occupied Palestinian Territories who suffer from trauma having been victims of violence directly or indirectly linked to the conflict. MSF has been providing these services not only in Hebron and in East Jerusalem but also in the area of Nablus including Qalquilya and Tubas Refugee Camp and in all the districts of Gaza. Most of our patients report that they have suffered arrests and detentions, either by the Israeli security forces or by the Palestinian Authority, or that they have been subject to violence in their neighborhood in their daily life and interaction with the settlers, or that they have suffered an incursion by the Israeli armed forces in their own house. These incursions are usually search operations of the armed forces of IDF, the Israeli Defense Forces, who enter in the Palestinian homes most of the times during the night in search of alleged terrorists or activists, in order to detain them. According to reports from UN and other organizations, every week there is an average of 50-70 night incursions in Palestinian homes in the West Bank, a number that is quite high, even if compared with the number of arrests. And the way they are conducted can become very violent and traumatic. These operations are usually conducted with a large amount of soldiers heavily equipped who use guns, noise bombs, tear gas bombs, and dogs; in other words they are meant to be very intimidating. According to witnesses and victims, the use of violence is frequent with the destruction of furniture and goods, beating and verbal abuse, etc. ; children and elders are not spared of witnessing this violence and sometimes they suffered it themselves. Many of our patients are children that have witnessed these incursions and have seen how the soldiers have treated the members of their family. Many times they see their fathers or brothers being beaten up and taken away by the soldiers. This type of experience in many occasions produces a trauma, especially to children, that is very difficult to handle and manage without psychological support. What are the challenges that MSF is facing working in the Occupied Palestinian Territories? The work of MSF in the Occupied Palestinian Territories is very challenging because of the complex characteristics of the conflict. MSF strives to maintain a position of absolute neutrality and independence between all the parts of the conflict. It is not only Israel against Palestinians, it's also the violence among different Palestinian factions and all the consequences of the violence produced by the conflict in the long term, the lack of access to education, the lack of access to jobs, the lack of access to health services, etc etc, all these at the end also create a lot of violence, social violence. In this setting MSF teams try to provide the much needed psychosocial support to the people who have been affected by this violence, always following the principles of humanitarian action of independence, impartiality and neutrality and focusing on the persons and not on the political side.